In Peter Menzel and Faith D’Aluisio’s new book, What I Eat: Around the World in 80 Diets, we get a first-hand glimpse of how (and what) different people around the world consume on a daily basis. 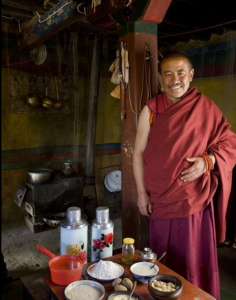 For example, the Tibetan monk (pictured below) who, on a typical day, consumed 4,900 Calories. Documented intake for other people ranged from 800 Cal/day all the way up to 12,000. Monks have been drinking butter in their tea for centuries. The only difference between them and the bulletproof coffee advocates is that their blood triglyceride levels probably look pretty good. In addition to being a fascinating piece of cultural anthropology, we’re sharing this because our members and friends know that the issue of intake is not as cut and dried as it’s often made out to be. Factors like bodyweight, activities of daily living, and whether food has been processed (making it easier to extract both calories and nutrients) are significant. In many ways this feels like an adjunct to another powerful photographic series. In that one, the question, “What do athletes look like?” was asked. Photographer Howard Schatz answered, in part, with a fascinating side-by-side comparison of champions from different disciplines. Understanding the unbelievable level of variance from person to person helps us understand our own place in the continuum between surviving and thriving. For information on training and distance coaching programs, visit us at bangfitness.com.